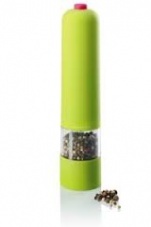 Touch Grind electric pepper mill by CKS zeal, grinds peppercorns at a touch. A much used pepper grinder in our house, easy to use with one hand. 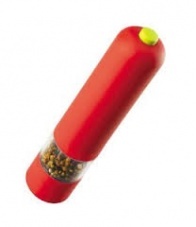 Has an adjustable grinding mechanism for perfect pepper. Takes 4 A4 batteries (not included). There is a light that lights up your plate, so that you can see easily, even in low light. Comes in a choice of three colours, lime green, black or red.